Are you wondering what is Gravity Space Ads? You should remove Gravity Space Ads immediately, because it is a virus that should be exterminated from Chrome, Firefox, Internet Explorer and Safari. Gravity Space Ads is a nasty piece of software that functions remarkably similar to a type of viruses called Adware. As you have noticed it will generate a large amount of advertisements (Ads) and throw them in your face whenever possible. The most common triggers are you starting your internet browser or loading a new page/tab while using it. Ads spawned by Gravity Space Ads can vary a great deal. Usually they will take the form of a pop-up message or a banner or great size. They will be big enough to hinder your normal work with the computer demanding your attention to them in order to close them. Ads can also appear as whole new pages that often parallel to whatever you were loading in the first place. Yet another form of Ads is when words of any text you might be reading become underlined and hyperlinked, so hovering the mouse over them reveals an expandable window. 2: Remove Gravity Space Ads from Chrome, Firefox, Internet Explorer and Safari. 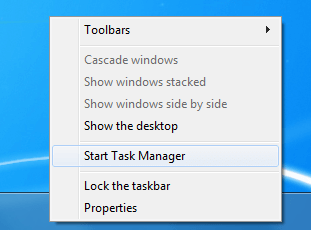 5: Permanently remove Gravity Space Ads from Task Manager’s processes. First and foremost Gravity Space Ads slows down your computer. Every time an Ad loads it uses processor time and internet bandwidth. Since it happens simultaneously to another operation you order it will delay it. If you are using a an older computer, or have poor connection to the internet this might even lead to freezes and non-responsive lock-ups. Viruses like Gravity Space Ads are also known to propagate other viruses. Very often you will be presented with the opportunity to download something. 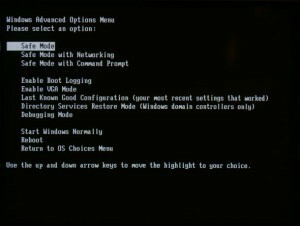 This something could be a large variety of things – but most often it will be some kind of free software intended to repair a non-existing problem with your computer. It’s possible that even you are given a fake warning about such a problem by the virus – missing plug-ins, virus infestation, registry errors and the like. Any file you download and install like that will be an actual virus. Removing viruses is getting harder and harder with every year. Nowadays there often exist multiple copies of the same virus, on the outside they are all similar. 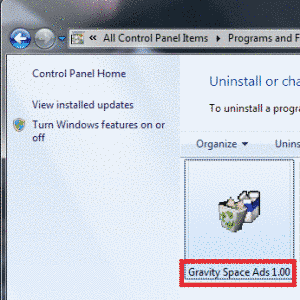 The difference is when you try to remove Gravity Space Ads from your PC. Depending on what version you have you might have to perform different operations. We’ve tried to write this guide to encompass all possible iterations of Gravity Space Ads. Unfortunately this automatically entails that some of these Steps might not be really necessary. If at any point you do not recieve the expected outcome as written from a step and you are certain you’ve carefully followed the guide then you’ve come upon such a step. Simple move on to the next one. Gravity Space Ads is quite capable of existing in all of your installed internet browser at once. It can infect even those you don’t regularly use and it will copy itself between them whenever any version is deleted from a browser. This means that you will have to repeat Steps 2&3 for every browser separately and without rebooting your computer between doing it. Also – try to remember – did you download and installed anything as prompted by an Ad from Gravity Space Ads. If the answer is yes then look out for the name of that file as it is a virus. If you encounter it remove it along Gravity Space Ads. You can search a detailed removal guide for it once you are done deleting Gravity Space Ads. Find Gravity Space Ads . Remove it by pressing Disable. Gravity Space Ads should be somewhere around here – Remove it. IMPORTANT WARNING! READ BEFORE PROCEEDING! What follows is a few mandatory steps, that are unfortunately also pretty difficult and dangerous to perform, so be extremely careful. Doing this wrong can damage your PC significantly. If you are not feeling comfortable, we advise you to download a trusted anto-malware program to do this for you. If you are confident in your abilities proceed forward. Remember that if a process seems suspicious to you but you are not certain about it you could just “Google” it. 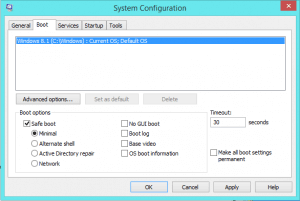 Deleting files associated with Windows could cause a corrupted OS and prevent your computer from even loading Windows!